When you need to accomplish something you need to be focused. 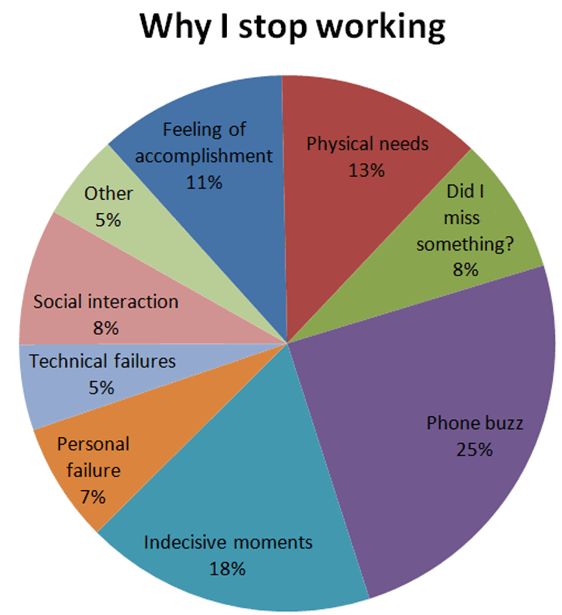 You want to work for a longer period without getting distracted. However, in my situation it is not uncommon that I catch myself taking unplanned breaks. I am scrolling through Facebook, checking my mails or Twitter before I even consciously recognize that I am taking a break. How is that possible? It is weird how your unconscious mind wants stuff that you don’t want. It seems like going to the toilet, checking your phone or looking a new e-mails are some kind of reflexes to certain situations. But to what kind of situations? The largest distractor for me is the buzz of the phone. When my phone vibrates, it is just very hard for me to ignore the buzz. I just have to look at my phone. It might be something important! Maybe someone needs me? It could be something on my agenda what I have forgotten. An urgent e-mail? Who knows?! Often it is just something unimportant like a impersonal Facebook notification so these buzzes could be fewer. I could put my phone on silent mode to solve the problem but then I might forget/ignore important things. Plus, I probably will keep the tendency to check my phone once in a while. When I expect a call, an answer to my e-mail I am waiting on my phone to buzz. But I don’t always feel my phone vibrating in my pocket. So just to be sure, I check my phone regularly to see if I didn’t miss it. This is also a category in my pie-chart that causes eight percent of my distractions. Nonetheless, silencing unimportant apps like Facebook, or certain group chats might be a good thought. 18% of the times I want to take a break are moments that I don’t know what to do. At these moments like these I could be stuck with a dilemma and I don’t know which one to choose. Or a moment that I am not able to finish a sentence that I am writing on. At these moments I sometimes just flee from the dangerzone. I stop what I am doing, and start taking a little break. I am not that sure how stupid that is. I would assume, that it would be more productive if I just keep working on this problem to solve it instantly. However, cooling down the brain a little while doing something else might also improve my decision-making skills. Sometimes I am just thirsty or need to go to the bathroom, not much more to say. Setting daily goals works great. However, it seems like when achieving these daily goals I have the longing to reward myself. And that is often with a little break. I wouldn’t say these breaks are always bad. Rewarding yourself is motivating to keep you going. But are they always necessary? And how long should they be? I will describe the rest of my distractions quickly, next on the list is social interaction. When my colleagues are around me I can be distracted by joining or initiating a conversation with them,that seems okay. The “personal failure” is a moment that I have the feeling that I can’t do something. I just want to quit what I am doing to feel comfort. Luckily, this is just a tiny reason. “Technical failures” is often a distraction caused by a computer that is processing something. When I have to wait on my computer I am very easily distracted. Good reason to buy a new one. This experiment taught me that taking breaks has roughly two sides. There are the external distractions with the main subject; “social interactions”, and the internal distractions with the main subject; “success and failure”. Regarding the external distractions, these distractions are mostly social nudges that keep me from working, and I have the eager to respond to it. I value social interactions. During working hours my social life communicates mostly through my phone. And the problem is, I am having a hard time ignoring my phone vibrations, many of us have this problem. I am capable to ignore my phone for a bit but I just have to see what is happening after a while. Anyhow, these phone buzzes is an interactive and expanding process. As I mentioned in my phone addiction article, the more messages you send, the more responses you will get, the more your phone will vibrate. It could be wise for me to send fewer messages or to postpone my answers once in a while to keep my phone from buzzing that much. Regarding the internal distractions I have two sides. The first side is the “failure”, where I can’t seem to decide or finish what I am doing. It could be a hard dilemma, a difficult assignment, or something that doesn’t work. Instead of solving the problem or working on something else for a while, I tend to take a break and do nothing. That is not very productive, however it could be helpful to cool down my brain for a few minutes and start over again. The other side of the story is the story of success. When I achieved something difficult or received good news I often reward myself with some minutes “pleasure time”. I think that is not a bad thing. However, I have no rules on how long a break should be. Something I could work on in the future.